I would have promoted this in-store Shopping Cart Cup Holder and Rack more clearly with a sign. From a distance it is difficult to understand what it is. 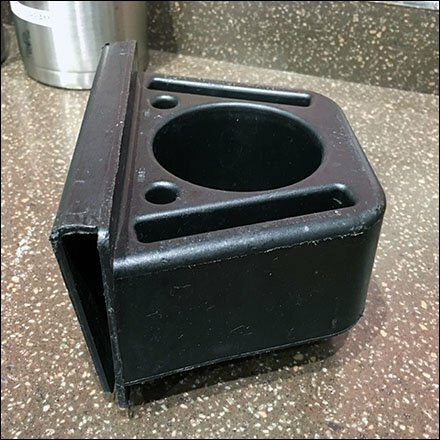 But upon inspection you find that you can take advantage of in-store Coffee as amenity, and take it with you in this Shopping Cart Cup Holder. Look close to see that it also provides recesses for your cell phone, note pad or shopping list, and pen or pencil. With support like this your customers could make a day of it. The only think missing is in-aisle coffee refills delivered to you anywhere in the store. This Shopping Cart Cup Holder and Rack seen at Wegmans.